Timer 2 period register value. 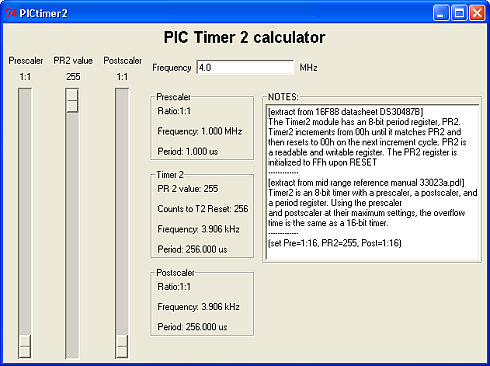 Jump to PIC Timer 1 calculator. Three sliders let you change the values by dragging a control up and down on the screen and the resulting changes are immediately shown in this page. The first is for the prescaler, the middle is for the Period register and the last is for the postscaler. Note: Setting of timer 2 value is not shown as the intended use of the timer is for making it easy to control the period of TMR2 using the period register - taking away the need to service interrupts in order to generate a specific frequency. All you do is set the Prescaler and Postscaler and set the period register PR2. For example if you set Prescaler=1:1 and Postscaler=1:1 and PR2=99. The output period of the module would be 100us i.e. a Timer 2 interrupt every 100us. Note: Timer 2 counter is reset on the next count after matching PR2 (this is why you need PR2=99 and not 100). The important point is that there will be no need to set any registers within the interrupt (as you have to do with the other timers). 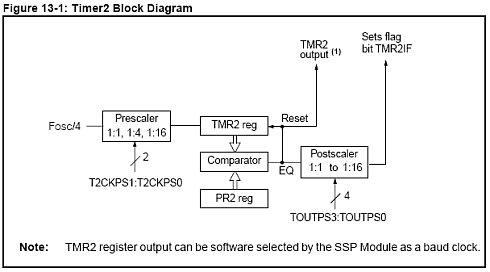 This is why it is used as the baud rate generator for the USARTs - it requires no processing.